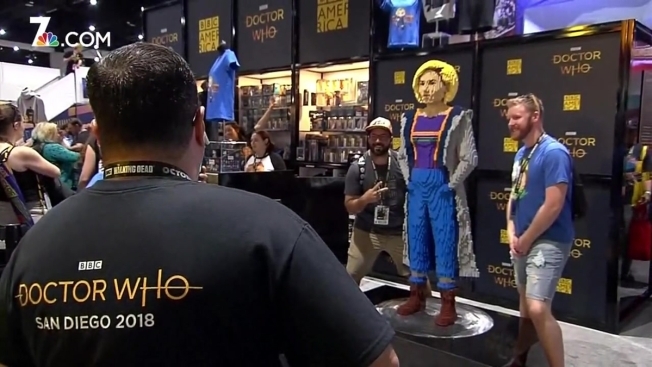 Fans posed with a LEGO version of the Thirteenth Doctor on the floor of the San Diego Comic-Con Thursday. There were sales of exclusive merchandise including Doctor Who shirts, keychains and toys. Some 6,500 Comic-Con attendees cheered on the 13th "Doctor Who" Jodie Whittaker Thursday in San Diego in her first public appearance since getting the coveted role. Whittaker is the first woman to play the role, which has also been played by Peter Capaldi and Matt Smith. The English actress described the Comic-Con experiences as "loud" and "amazing" and says she has felt "lots of support." Many fans in the convention center's Hall H waited in line overnight to get a spot in the panel. Some also wore their best Doctor Who costumes. Little was revealed about the upcoming season of the highly secretive show. The new showrunner Chris Chibnall says its important to preserve the communal viewing experience. The 11th season will debut on BBC America in the fall.